Dr. Sena received his bachelor’s degree from Wayland Baptist University, Plainview, Texas, the Master’s of Religious Education degree from Southwestern Baptist Theological Seminary, Fort Worth, Texas and the Doctor of Ministry degree from Golden Gate Baptist Theological Seminary, Mill Valley, California. For more than 45 years, Bobby has served in a variety of roles in the Southern Baptist Convention. 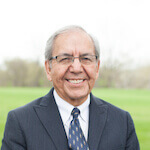 He has served as pastor of small and large Hispanic churches in Texas and Georgia, Church Planting Missionary in New Mexico, and National Multi-Ethnic Evangelism Consultant for the Home Mission Board, Hispanic Evangelism Associate in the Baptist General Convention of Texas and National Hispanic Missionary NorthAmerican Mission Board. In addition, he served as Co-Chair of the Hispanic Advisory Council, a three year initiative, created by Dr. Frank Page, president of the SBC Executive Committee, on September 20, 2011. He has been married for 48 years to Priscilla,, who worked for the Department of Federal and Special Programs Gwinnett County Public Schools, in Georgia, until her retirement in 2010.